It’s funny the things you overlook when you first read a document. Or even on the second or third time. I was in the middle of assignment work for my course with the IHGS, focusing on military records, and so had been going over what records and notes I had for my great grandfather, Alexander Wright, who fought at Gallipoli during World War I. He was one of the lucky ones who made it back home. And I’m lucky that he “left” the Royal Irish Fusiliers and joined up with the New Zealand Expeditionary Force at the outbreak of war, as that means his service record survives! Upon reading over his service record, something in his physical description suddenly jumped out at me. The description of his tattoo. I had skimmed over it before and had idly wondered what the “clasped hands” might signify, but it was only when re-reading it again recently, that I noticed the name that he had tattooed on his right arm: H. Cavender. And I suddenly remembered that I had seen that name before, in a census return. 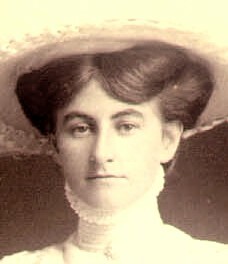 Hilda was a boarder with the Carroll family in 1911, maybe because it was close to where she worked. There is a building called the Tea Factory in nearby Brockley, which was built in the 1940s to replace the old warehouse that had been bombed during World War II3. 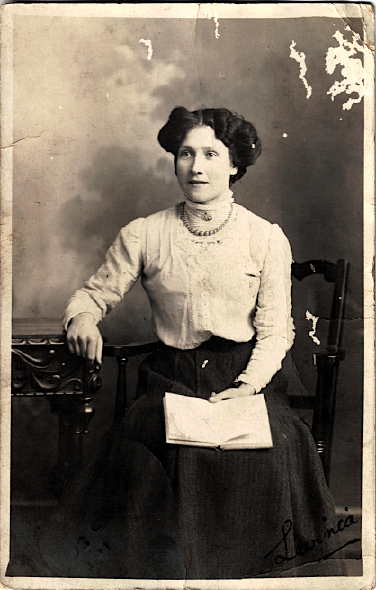 In the 1901 census, Hilda was living with her parents Alexander and Mary at 354 Evelyn Street in Deptford4. By 1911, her father and stepmother were living in 36 Woodpecker Road5, about 16 minutes walk away from the Carrolls (thanks Google maps!). Maybe Hilda didn’t get on with her stepmother? And then I remembered where I’d also seen the name Hilda – in a postcard to Alexander from his sister Mollie (Mary Freeth). Sounds like Alexander and Hilda might have been sweethearts. So what happened? All sorts of scenarios have run through my head. Alexander deserted from the Royal Irish Fusiliers at some point after this and before 1914, when he mysteriously turns up in New Zealand, and enlists in the NZEF. Did he run away because he was miserable with Army life, or perhaps Hilda had taken up with someone else? Perhaps she became pregnant and he couldn’t handle the responsibility? His mother Mary Jane was from a military family and it would have been so hard for him to face her after deserting – what could possibly have made him do it? Looking again at Alexander’s attestation form, on his Military History Sheet, it asks for his “Intended place of residence on discharge” and Alexander has stated “London”. So, he meant to go back. Did Hilda wait for him? In the June quarter of 1916, a Hilda Cavender married William H. Danson in Wandsworth7. Meanwhile, Alexander had been wounded at Gallipoli and was transported back to New Zealand, being discharged from the NZEF on 21 May 1916 as medically unfit1. He married Elsie Nunns on 7 June 1917. “1911 England Census, John Carroll (age 62) household, St Nicholas Deptford, London,” digital image, FindMyPast, (http://www.findmypast.co.uk/ : accessed 14 Apr 2011), PRO RG14/2640, Greenwich registration district, Deptford East sub-registration district, ED 28, household 32, 02 Apr 1911. “The Tea Factory”, DPS Property Holdings, http://www.dpsproperty.com/gallerydetails.php?galId=3 : accessed May 2013, page no longer available. “1901 England Census, Alexander Cavender (age 33) household, Deptford St Paul, London,” digital image, Ancestry.com, (http://www.ancestry.co.uk/ : accessed 14 Jun 2013), citing PRO RG13/524, folio 79, p8, Greenwich registration district, Deptford North sub-registration district, ED 8, household 44, 31 Mar 1901. “1911 England Census, Alexander Cavender (age 43) household, Deptford St Paul, London,” digital image, Ancestry.com, (http://www.ancestry.co.uk/ : accessed 14 Jun 2013), PRO RG14/2608, Greenwich registration district, Deptford North sub-registration district, ED 14, household 62, 02 Apr 1911. 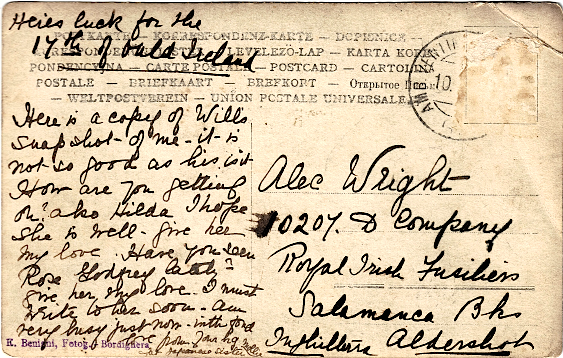 Postcard addressed to Alec Wright, sent by Mary Freeth, dated 10 Mar 1908(? 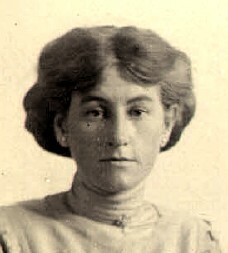 ); digital image, original held by [NAME AND ADDRESS FOR PRIVATE USE], granddaughter of A. Wright. “England & Wales, FreeBMD Index: 1837-1983,” database, FreeBMD (http://www.freebmd.org.uk/cgi/search.pl : accessed 2013), marriage entry for William H. Danson and Hilda F. Cavender; Jun 1916 [quarter] Wandsworth 1d [vol] 1462 [page]. Early last year I began a series of posts on the Brosnahan family. Well, “one” of the Brosnahan families, as there were a few that settled in South Canterbury, New Zealand, around the same time. My great great grandmother, Margaret Brosnahan, emigrated to New Zealand with her older brother John in 1862, travelling aboard the Echunga. Their parents and siblings joined them a couple of years later. Margaret’s grandson, my grandfather Dom Gaffaney, went to boarding school with his “cousin” James Brosnahan, who became a Marist priest and married my grandfather and his bride, Agnes Burke. What I wanted to find out, and the reason I started looking into the Brosnahans in more depth, was how Father Jim was related to the family – what level of “cousinage” (and if that’s not a proper term, it should be) was he to my grandfather? So, I began tracing all of my great great grandmother’s siblings, mainly focussing on her only brother John, and you can follow my series of posts from the beginning. I didn’t do too bad a job I thought, had identified 10 out of 12 of John’s alleged children and their children. But, no Father Jim that I could see. 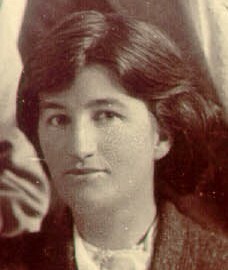 Several months later I was contacted by the wife of one of John Brosnahan’s descendents – she had some answers! (Don’t you love those kinds of emails?) Another of John’s descendents had compiled a family history in 2001, and my contact very kindly scanned and emailed it to me. So the two that I missed were James and Michael, and their children. But there was no Father Jim. A couple of months ago I purchased a second-hand copy of Seán Brosnahan’s book The Kerrytown Brosnahans, about his family who emigrated from Co. Kerry, Ireland to an area in South Canterbury that became known as Kerrytown, not far from my Brosnahans in Temuka. I’d been waiting to get my hands on a copy for ages, ever since I’d heard about it. And it didn’t disappoint – Seán not only writes about his own Brosnahan family, but also the “other” Brosn(ah)ans, like mine. He couldn’t find a definite link between these different families, but doesn’t discount that they may be related further back, and they certainly intermarried once they were in New Zealand. And there was Father Jim. 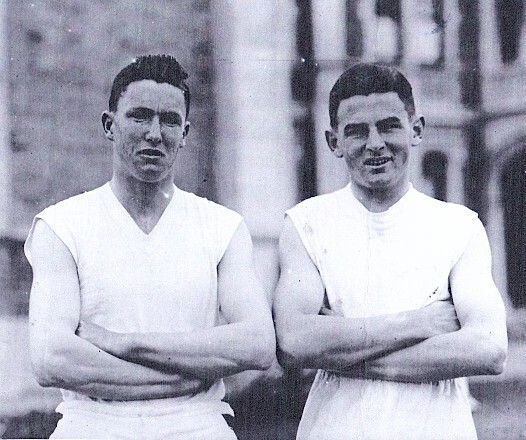 Sean’s great great grandfather Hugh with his brother Timothy, were the patriarchs of the Kerrytown Brosnahans. On my two year blogiversary, I am thankful for Father Jim, cousins with answers, cousins with questions, awesome family historians who publish their research, and everyone who’s been reading and commenting on this blog. Brosnahan, Seán G. The Kerrytown Brosnahans, R.J. & H.P. Brosnahan (Timaru: 1992). Brosnahan, Tim. “Brosnahan Family History”, 2001; digital images scanned from original by [NAME & ADDRESS FOR PRIVATE USE], 2012. Thankful Thursday is an ongoing series at GeneaBloggers. 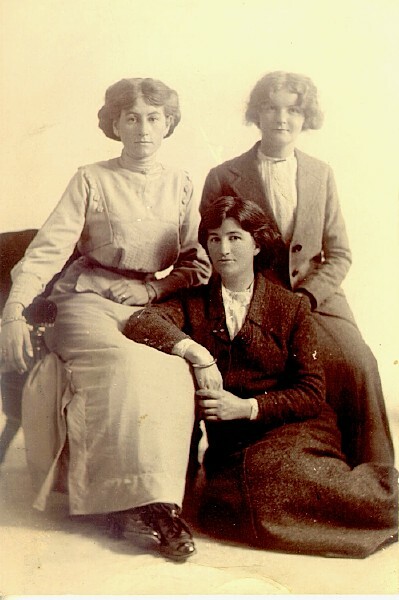 Following on from yesterday’s post, I decided to have a look through some family photos, to see if I could find any likenesses to the three women in the photo. This is one of the photographs I had dated at WDYTYA? Live by Maureen Taylor, so now I have a date of around the early 1910s. However, that’s about all I know – I’m not even sure if these three are, in fact, sisters. I’m wondering if the woman on the left could be my great grandmother, Margaret (O’Rourke) Gaffaney. 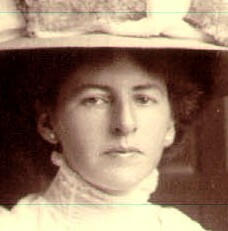 She married Peter Gaffaney in 1909, and a ring is quite prominently displayed on her left hand. Margaret had three older sisters (another sister died in infancy), so two of them could be in this photo with her. I need to go through my stash of family photos to see if I can positively identify them. It’s a lovely photo, whoever they are! Mystery Monday is an ongoing series at GeneaBloggers. Who the heck are these folks? I’d love to know who these people are. 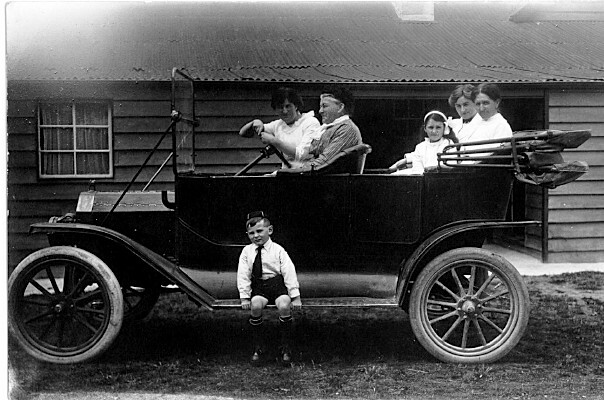 I think that the boy sitting on the running board is my grandfather, Michael Dominic Gaffaney (known as Dom, born 19101). And if so, his mother Margaret (O’Rourke) is probably the one sitting at the back of the back seat of the car. So, is this taken down south, in South Canterbury, where my grandfather grew up near his father’s family, or is it taken up north, in Napier, where my grandfather’s mother is from? Are the people with him (if it is indeed my grandfather), Gaffaneys or O’Rourkes? Now, it looks to me like the older woman is the same as the older woman in the previous photo. And the girl is the same as well. And, there is my (possible) grandfather again, too. Are these all the same boy? I think these three children are the same children photographed with the older woman above. And so it definitely places them in South Canterbury. 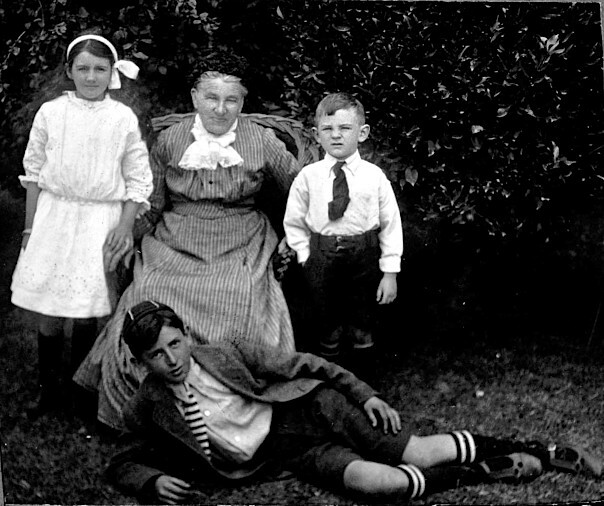 From the Temuka gathering, the names given to this group photo were: Tom Gaffaney, Peggy Barron and Albert Halley [sic]. I wonder if Tom was confused with Dom? They would all be first cousins. But, the “Tom” in the photos looks much younger than “Peggy”, who was born a year later. 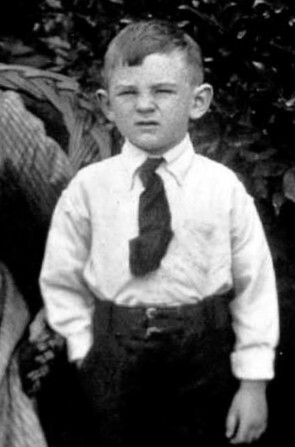 Other possiblities could be Thomas’s siblings Arthur (born 19085) or George (born 19106). However, I’m still thinking (hoping?) 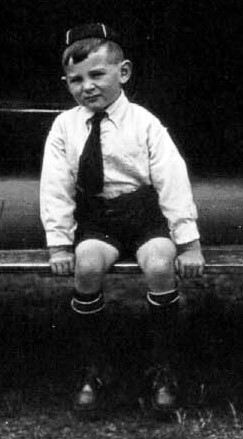 that the boy is in fact my grandfather, Dom. What do you think? NZ Dept of Internal Affairs, “Birth Search,” database, Births, Deaths & Marriages Historical Records (https://www.bdmhistoricalrecords.dia.govt.nz/search/ : accessed 2011), entry for Michael Dominic Gaffaney, 1910/25894. NZ Dept of Internal Affairs, “Birth Search,” database, Births, Deaths & Marriages Historical Records (https://www.bdmhistoricalrecords.dia.govt.nz/search/ : accessed Jan 2012), entry for Thomas John Francis Gaffaney, 1906/2249. NZ Dept of Internal Affairs, “Death Search,” database, Births, Deaths & Marriages Historical Records (https://www.bdmhistoricalrecords.dia.govt.nz/search/ : accessed 2011), entry for Margaret Christina Ogston Barron, 2006/16023. NZ Dept of Internal Affairs, “Birth Search,” database, Births, Deaths & Marriages Historical Records (https://www.bdmhistoricalrecords.dia.govt.nz/search/ : accessed Jan 2012), entry for Daniel Albert Hally, 1902/6784. NZ Dept of Internal Affairs, “Birth Search,” database, Births, Deaths & Marriages Historical Records (https://www.bdmhistoricalrecords.dia.govt.nz/search/ : accessed Jan 2012), entry for Arthur Marcus Gaffaney, 1908/25001. NZ Dept of Internal Affairs, “Birth Search,” database, Births, Deaths & Marriages Historical Records (https://www.bdmhistoricalrecords.dia.govt.nz/search/ : accessed Jan 2012), entry for George Joseph Gaffaney, 1910/15483. A prominent figure in musical and friendly-society circles for many years, Mr Alexander Wright died yesterday at Gisborne and is to be interred at the Taruheru cemetery tomorrow, following a service to be held in Cochrane’s private chapel at 2.30pm. 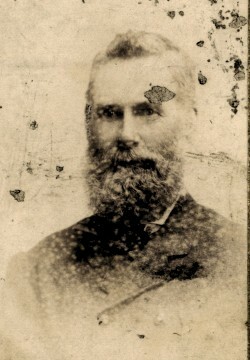 Mr Wright was born in London and came to New Zealand as a boy, residing first in Christchurch and later coming to Gisborne, where he commenced his working life. He volunteered for overseas service soon after the outbreak of the First World War and suffered wounds on Gallipoli which resulted in his being invalided back to New Zealand. I wonder if there was more to the obituary? It doesn’t sound like it’s quite finished – unless it was published in a Napier publication, and so only included information pertinent to that locality? The obituary answers a few questions we had about Alex, though it raises several more! How did he get to New Zealand “as a boy”? He’s definitely in England in 1901 (with his mother Mary Jane in Deptford), and I have a postcard addressed to him when he was in the Irish Fusiliers based at Aldershot – the postmark looks as though it is dated April 20, 1911.3 (I’m no expert – but it looks similar to those I found online). If I’m correct about the date, Alex was still in England at 20 years of age. 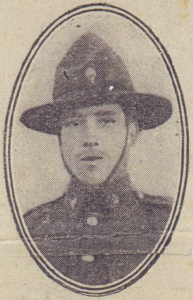 I found a possible reference to him in the 1911 census4, with the 1st Battalion Royal Irish Fusliers and correct age and birthplace, but he’s listed as “Alexander Patrick John Wright”, so I’m not entirely convinced this is our Alex. The middle names look as though they’ve been added afterwards, perhaps (and there are another couple of instances of this on the same page). They could all be the same person, or maybe no. 2 is our Alex? 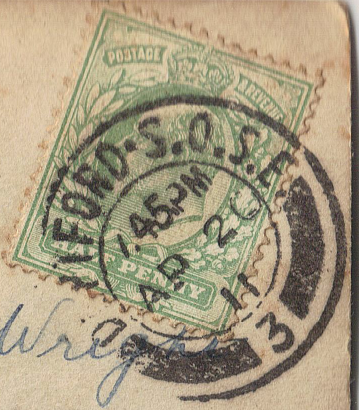 He was definitely in New Zealand by 1914, when he enlisted with the New Zealand Expeditionary Force. Sunday’s Obituary is an ongoing series at GeneaBloggers. “Online Cemetery Record Search”, entry for Alexander Wright, burial 02 Aug 1956; database, Gisborne District Council (http://www.gdc.govt.nz/online-cemetery-record-search/ : accessed 21 Oct 2010); MI: “NZEF, Great War Veteran 10/800 L/Cpl A WRIGHT, Wellington Regt, died 31 July 1956 aged 65”. 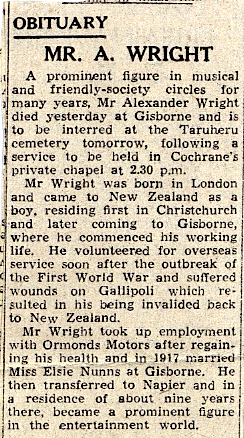 “OBITUARY”, obituary of Alexander Wright, clipping from unidentified publication, dated 01 Aug 1956; photocopy, original held by [NAME AND ADDRESS FOR PRIVATE USE], grandson of deceased. 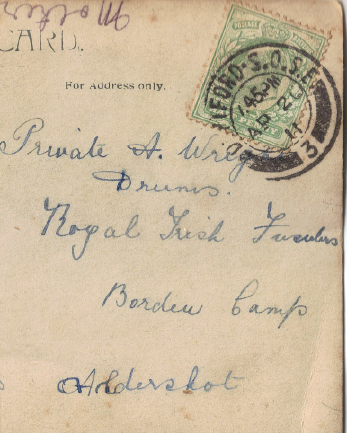 Postcard addressed to Private A. Wright, sent by Lavinia (Wright) Luxton, dated 20 Apr 1911(? 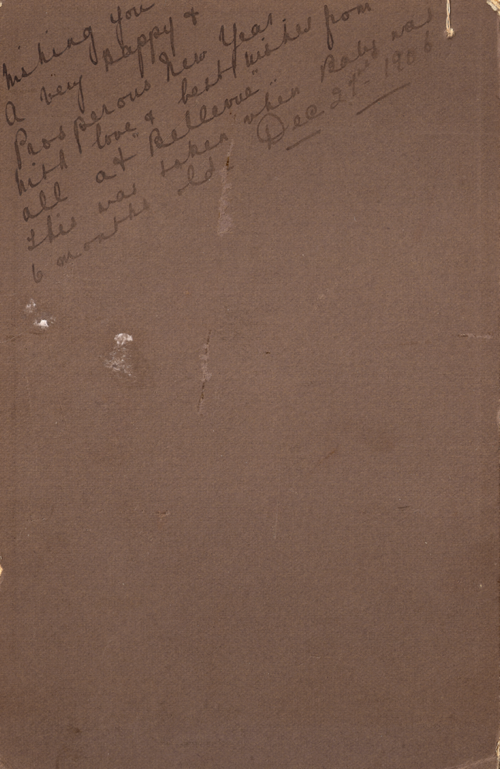 ); digital image, original held by [NAME AND ADDRESS FOR PRIVATE USE], granddaughter of A. Wright. 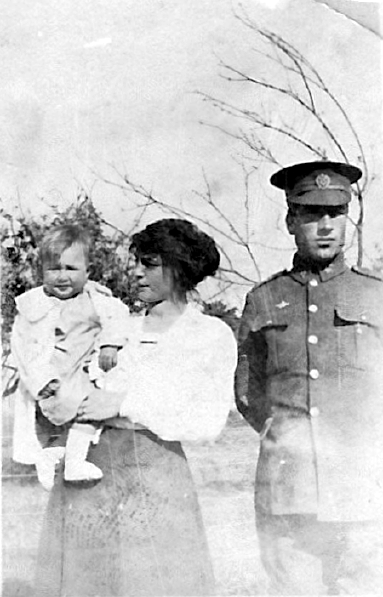 My great grandparents, Elsie Nunns & Alexander Wright - but who is the baby? What caused the confusion was the identity of the baby, and Alex being in uniform. The most likely candidate for the baby in the photo is my grandfather, George, who was born in May 1918. The baby looks around 12 – 18 months old (?) 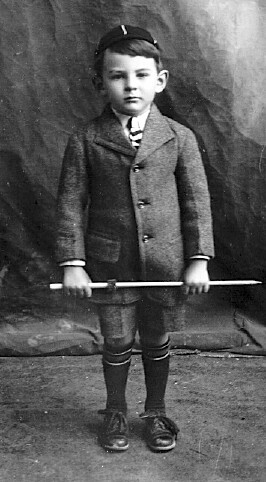 so if he is the baby, this would have been taken around mid to late 1919. Elsie and Alex married in June 1917. At that point, Alex had been discharged from the New Zealand Expeditionary Force, and that would be why he wasn’t in uniform for his wedding. So why would he be in uniform in 1919? From checking uniform images online, it does look like an NZEF one. The other thing is, Alex seems completely disinterested in a. the baby; and b. having his photo taken. It doesn’t seem like a ‘Happy Family’ type snapshot! It would be useful to get the photo dated properly, maybe by what Elsie is wearing. 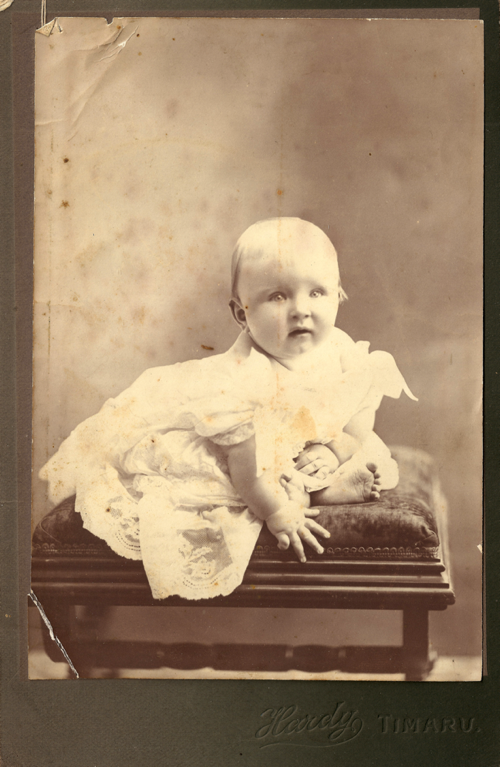 The photo was in the possession of Elsie’s aunt originally – maybe the baby is one of Elsie’s cousins? The aunt married in 1910, so it’s not unlikely. Perhaps then this was taken before Elsie married Alex, and before he was discharged from the NZEF? You may remember my disappearing Florey family from earlier posts, and my attempt to track them down. The Floreys were last seen living in Wateringbury at the time of the 1841 census, but I hadn’t been able to find any of them until Henry Richard Florey, my great great grandfather, turns up in 1871 living in Rochester. Where did the rest of them go? I decided to follow his half-sister Jane first – I had her baptism record, and a possible marriage for her – and ordered the marriage certificate from the GRO. I still can’t find Jane in 1851. There are some Alfred Popes around, but none with a wife Jane. I did find a death for a Jane Pope in 1847 in Maidstone2 – could this be her? Should I go ahead and order the certificate, or change tack and try and find her brother William? England, marriage certificate for Alfred Pope and Jane Elizabeth Florey; 06 Apr 1846, Maidstone; citing 1846 Jun [quarter] 05 [vol] 405 [page], General Register Office, Stockport. “England & Wales, FreeBMD Index: 1837-1983,” database, FreeBMD (http://freebmd.rootsweb.com/cgi/search.pl : accessed 14 Mar 2011), death entry for Jane Pope; citing 1847 Jun [quarter] Maidstone 5 [vol] 244 [page]. As mentioned in an earlier post, I lost track of my Florey household from the 1841 census until Henry Richard Florey turns up with wife and kid in 1871. Where did the others go? And where was Henry during those 30 years? Since I’ve found what I think is Jane Florey’s baptism, I’m starting with her. In the 1841 census her age is listed as 19. If the baptism record is hers, her actual age was 16. So, within the realms of possibility. No occupation is listed. Interestingly enough, one of the other brides in the register was a Mary Ann Florey. I wonder if she is related to Jane? Anyway, yesterday I ordered Jane’s marriage certificate from the GRO. Hopefully that will confirm her father’s name, as well as her husband’s. I found a couple of marriages for William Florey as well, but there is a second William Florey who was born in Maidstone around the same time as my William, so need to do a little more research before I start ordering certificates. “England & Wales, FreeBMD Index: 1837-1983, ” database, FreeBMD (http://freebmd.rootsweb.com/cgi/search.pl : accessed 11 Jan 2011), marriage entry for Jane Elizabeth Florey; citing June [quarter] 1846, Maidstone, vol 5: 405.